I found a copy of Haydn’s Dictionary of Dates under the bed in the spare room – no I’m not in the fortunate position where books appear as though by magic in my house- I’m doing the spring-cleaning and it was in a box belonging to my husband. The book – not the husband- dates from 1906, is 4 inches thick and each page has a delicious crackle. So, given that wielding a duster isn’t high on my list of favourite occupations I started reading…well what would you have done in similar circumstances? My attention was caught by a description of an angel, “a gold coin, impressed with an angel weighing four pennyweights, valued at 6s, 8d. in the reign of Henry VI and 10s in the reign of Elizabeth I,1562,” So, there’s inflation for a start and a reminder than once upon a time coins actually were worth their face value in gold or silver unless someone came along and clipped the edges. The first English gold coins were gold pennies and florins. They were superseded by the noble. In 1465 King Edward IV came up with a new gold noble which came to be called an angel because it had an image of the Archangel Michael on it. The Latin inscription (hmm don’t think that’s the right word to describe words on a coin) PER CRUCEM TUAM SALVA NOS CHRISTE REDEMPTOR means ‘Through thy cross save us, Christ Redeemer’. The angel continued to be minted until the reign of Charles I and was then replaced by a Guinea in 1663 –under the auspices of Sir Isaac Newton who was trying to prevent coin clipping by introducing a milled edge. I am reliably informed that the guinea, which still exists if you want to buy or race horses, for example, is worth £1.05. Talking of pounds they didn’t exist until 1583 – although there were coins with that value….the spring cleaning is starting to feel appealing again –little wonder the whole pre-decimal currency issue has been a mine field that I’ve shuffled edged around cautiously until this afternoon. 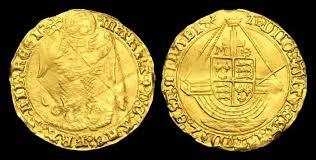 Instead of a pound your average pre-Armada Tudor gentleman would have had a sovereign in his pocket. It was worth 20 shillings so more valuable than an angel which was worth 10 shillings. Now because I went to school just before the world turned decimal I need to write the following information because it’s not lodged in my head: 12d = 1s and 20s = £1. And for folks even younger than me or reading this from elsewhere in the world d = pence which Wikipedia informs me is because rather than common old English the d is an abbreviation of the Latin denarius and s = shilling but the abbreviation s actually stands for the Latin sestertius; the initial letter is merely a happy co-incidence. 1 Mark =13s 4d – This is not an actual coin either. It was used by accountants and lawyers for monetary transactions like land purchases and dowries. 1 Angel = 10 shillings = ½ pound. Half-a-crown = 2 s 6d (As in ‘2 and 6’ which could “Buy you a visit to the cinema, fish and chips and the bus home afterwards when I was a lad.”- this anecdote will be familiar to many people with more mature family members who also insist on translating modern metric values into their imperial equivalent and then telling you that you could feed a family of six or buy a car on that kind of money in their youth which occurred at some point during the first half of the twentieth century… I’ve digressed.) Just to be difficult you could also get a quarter angel which was worth 2s 6d. But what was all that worth to the people who earned it and lived by it? A labourer would earn somewhere between £5 and £10 a year. Skilled workmen could earn 6d a day. 1lb of cheese cost 1 1/2d. It cost 12d to hire a horse for the day and 4d for a dozen eggs. This entry was posted in Uncategorized and tagged angel, £sd, coins, crown, Haydn's Dictionary of Dates, imperial coins, penny, pounds shillings pence, sixpence, sovereign, Tudor money by JuliaH. Bookmark the permalink. In my experience, a guinea was and is worth £1 1s. 0d., twenty-one shillings, which is now £1.05, NOT £1.10, which would be twenty-two shillings. Thank you for correcting me. You are absolutely correct and I appear to have taken leave of my senses. I shall amend the article immediately. There is probably a very good reason why I struggle with pounds shillings and pence.